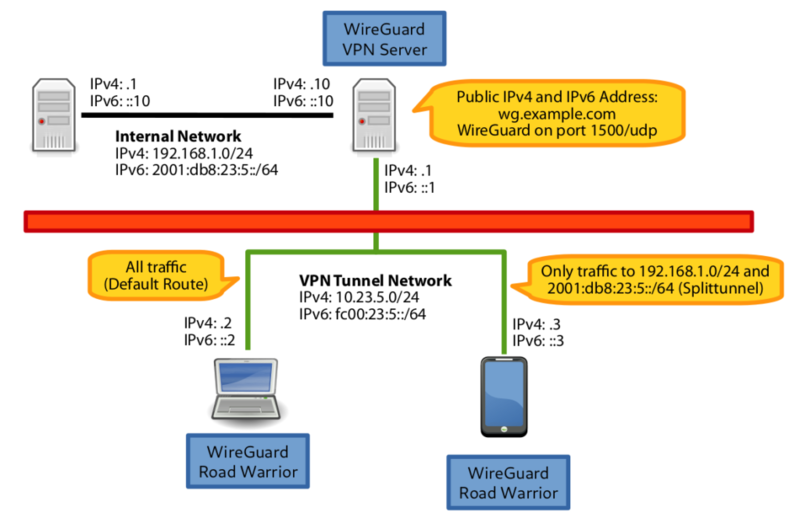 WireGuard is a VPN solution (alternative/replacement for e.g. OpenVPN or IPsec). The WireGuard setup and configuration is kept very simple. It implements a layer 3 tunneling protocol for IPv4 and IPv6. It’s written in ~ 4k single lines of codes. 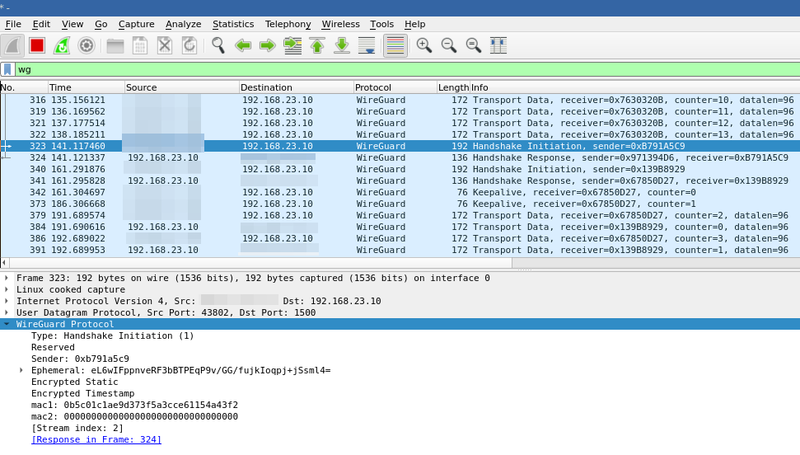 The encapsulated IP packets are inside UDP packets. It uses state-of-the-art cryptography (only strong algorithms like Curve25519, ChaCha20, Poly1305 or BLAKE2 are supported and no other ciphers can be configured). WireGuard runs in the Linux kernel (but there are also userspace implementations). Authentication is done using private/public keys, similar to SSH keys. Clients can perform roaming, like in mosh (https://mosh.org/). WireGuard does not respond to unauthenticated packages, so it is not possible to know if a server is running WireGuard if the sender is not authorized. It provides perfect forward secrecy. It does not disclose any identity because the public keys are never transmitted in cleartext over the internet. The key exchange (ECDH) takes only 1 round trip time. WireGuard is fast because it runs in the kernel space and because the used cryptographic algorithms are also very fast. More infos, a whitepaper, setup instructions or demos can be found on the project website: https://www.wireguard.com/. At some point, WireGuard will be integrated directly into the Linux kernel. Linus Torvalds said “it’s a work of art” and hopes it will be merged soon into the kernel: https://lists.openwall.net/netdev/2018/08/02/124. A road warrior is a person that uses a mobile client (e.g. notebook or mobile phone) to connect to their corporate or home network. The internal IPv4 and IPv6 intrastructure can be accessed from everywhere via IPv4 and IPv6. The WireGuard VPN client can be installed and used on Linux and mobile phones like Android. Either all traffic (default route) or only the traffic desired for the internal network can be routed through the VPN (split tunneling). This can be configured on the client. If a road warrior does not have an IPv6 connection, this can be provided through the VPN tunnel. The VPN server can also be behind a NAT router, because WireGuard works over UDP. Note: If the road warrior establishes a VPN connection with the mobile phone and uses the mobile phone as a WiFi hotspot for another device (like a notebook), the traffic from the WiFi hotspot is not routed through the VPN. I’m not sure why this is the case but this is maybe a limitation of the OS on the mobile phone. Install WireGuard according to the installation instructions (https://www.wireguard.com/install/). 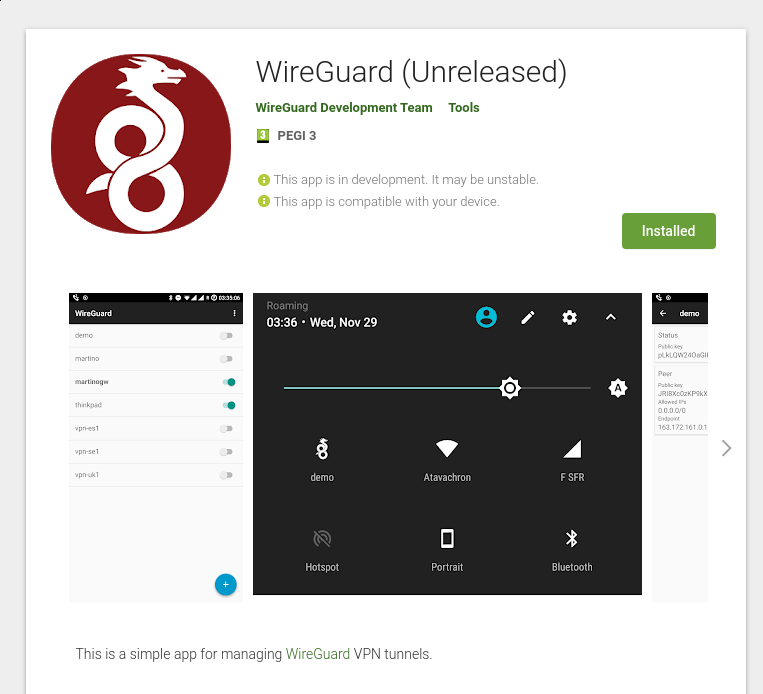 Install the WireGuard app from the play store: https://play.google.com/store/apps/details?id=com.wireguard.android&hl=en. This application implements WireGuard in the userspace. Therefore, the phone does not have to be rooted in order to use WireGuard. Generate a private and public key for every client. Note: These keys can also completely be generated on the client. Create a new configuration file for the server in /etc/wireguard/wg0.conf. The filename specifies the name of the VPN network interface. In this case, the new network interface will be named wg0. Address: The server gets the IPv4 address 10.23.5.1/24 and IPv6 address fc00:23:5::1/64 assigned. ListenPort: The server will listen for UDP packets on the port 1500. PrivateKey: This is the private key of the server generated earlier. PreUp: An iptables/ip6tables rule in the nat chain is added before the interface is created for performing NAT between the VPN clients and the destination. The interface (-o enxb827eb7dc89a) has to be adjusted according to the name of the outgoing interface on the VPN server. PreDown: When the VPN server is stopped, the NAT rules will be removed. AllowedIPs: This is the most complicated configuration option that confused me a bit in the beginning. This option always includes only IP addresses or networks that are available on the remote site. It’s not an IP address/network outside the tunnel (so no configuration from which public IP address a client is allowed to connect) but only addresses/networks which are transported inside the tunnel! In a road warrior scenario, where the client does not provide a whole network to the server, the netmask is always /32 on IPv4 or /128 on IPv6. Packets on the VPN server with this destination IP addresses are sent to this specified peer. This peer is also only allowed to send packages from this source IP address to the VPN server. It’s also important to know that there are no peers with the same AllowedIPs addresses/networks inside the same configuration file. If this would be the case, the server would not know to which peer the server has to send packages matching multiple peers with the same network configured. Address: The client gets the IPv4 address 10.23.5.2/24 and IPv6 address fc00:23:5::2/64 assigned. PrivateKey: This is the private key of the client. DNS: This DNS server is used on the client. This could be a DNS server in the remote network. PublicKey: This is the public key of the VPN server. Endpoint: This is the hostname of the VPN server. AllowedIPs: All traffic matching these networks is sent through the VPN tunnel. In this case, 0.0.0.0/0 and ::/0 means, that all IPv4 and all IPv6 traffic is routed through the VPN. Configuration file which will route only the traffic for the VPN (10.23.5.0/24 and fc00:23:5::/64) and for the remote network (192.168.1.0/24) through the VPN. The only difference is the AllowedIPs directive, which creates a split tunneling VPN setup. Only the traffic for the provided networks is routed through the VPN. Sep 23 20:48:09 wgpi wg-quick: [#] iptables -t nat -A POSTROUTING -s 10.23.5. Sep 23 20:48:10 wgpi systemd: Started WireGuard via wg-quick(8) for wg0. Sep 23 20:48:25 wgpi wg-quick: [#] iptables -t nat -D POSTROUTING -s 10.23.5. Sep 23 20:48:25 wgpi systemd: Stopped WireGuard via wg-quick(8) for wg0. PING 10.23.5.1 (10.23.5.1) 56(84) bytes of data. Sep 23 21:54:35 dimmbar systemd: Started WireGuard via wg-quick(8) for wg0. Sep 23 21:54:46 dimmbar systemd: Stopping WireGuard via wg-quick(8) for wg0..
Sep 23 21:54:47 dimmbar systemd: Stopped WireGuard via wg-quick(8) for wg0. More infos on how to decrypt data within Wireshark by providing key logs can be fond here: https://github.com/Lekensteyn/wireguard-dissector. I’m wondering how I can allow all the peers to talk to one another through the server? If you follow my setup, this is allowed by default. In the 2nd last screenshot, you can see how the phone pings the notebook via the Wireguard tunnel. Because this is no configuration option on Wireguard itself, this has to be done using other system tools. If you want to block it, you can use the iptables firewall and block this type of traffic. If you want to allow it but it does not work, you may have an iptables rule in place that prevents this access. you may want to include a single line before people create the wg0.conf & run “umask 077”. else you’ll get a warning that the conf is available to all..
Ah, I see. This is the default on my systems and therefore I had no issue. I added this hint in the tutorial. Yay, thank you! I’m happy you could use it! By default, WireGuard tries to be as silent as possible when not being used; it is not a chatty protocol. 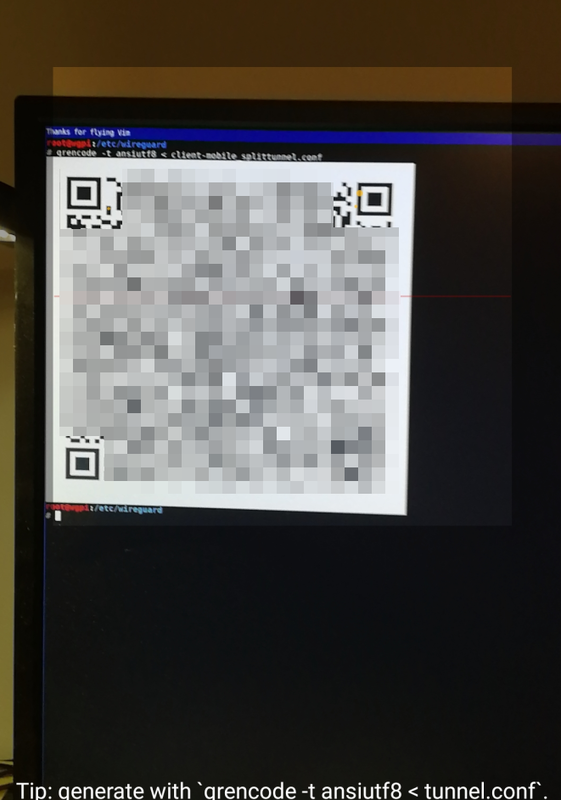 For the most part, it only transmits data when a peer wishes to send packets. When it’s not being asked to send packets, it stops sending packets until it is asked again. In the majority of configurations, this works well. However, when a peer is behind NAT or a firewall, it might wish to be able to receive incoming packets even when it is not sending any packets. Because NAT and stateful firewalls keep track of “connections”, if a peer behind NAT or a firewall wishes to receive incoming packets, he must keep the NAT/firewall mapping valid, by periodically sending keepalive packets. This is called persistent keepalives. When this option is enabled, a keepalive packet is sent to the server endpoint once every interval seconds. A sensible interval that works with a wide variety of firewalls is 25 seconds. Setting it to 0 turns the feature off, which is the default, since most users will not need this, and it makes WireGuard slightly more chatty. This feature may be specified by adding the PersistentKeepalive = field to a peer in the configuration file, or setting persistent-keepalive at the command line. If you don’t need this feature, don’t enable it. 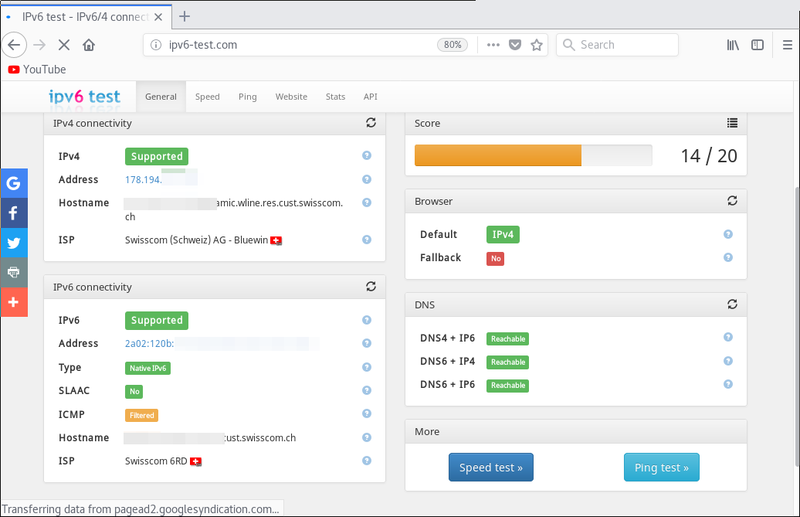 But if you’re behind NAT or a firewall and you want to receive incoming connections long after network traffic has gone silent, this option will keep the “connection” open in the eyes of NAT. I added a new section “Considerations when using NAT or stateful Firewalls” that covers that topic. It’s indeed a good idea. I have now checked all files and the keys are correct in the files. Thanks for advice. [ 7635.602503] wireguard: WireGuard 0.0.20181218 loaded. See www.wireguard.com for information. [ 7635.602504] wireguard: Copyright (C) 2015-2018 Jason A. Donenfeld . All Rights Reserved. Thanks a lot for the tutorial! Got it working without much trouble. I can’t however get it to work with a local DNS server (running on the same machine as the Wireguard server). It works like a charm if I do “DNS = 8.8.8.8”, but if I change it to “DNS = 10.23.5.1” or “DNS = 192.168.1.10” (or my equivalent) the DNS queries seems to get lost somewhere. I assume I’m maybe missing some iptables magic? – Is the DNS server configured on the client? You must have resolvconf installed for that. Otherwise, this will not work correctly. You can check it if the nameserver appears in the file /etc/resolv.conf. If not, you must install resolvconf or set the DNS server manually using the PostUp and PostDown configuration directive. – Can you ping the local DNS server? – Can you manually perform DNS queries? If you cannot reach the DNS server, this might be a firewall issue. Make sure that either your default netfilter/iptables policy is ACCEPT or you explicitly allow incomming DNS requests. Ah, you’re right. 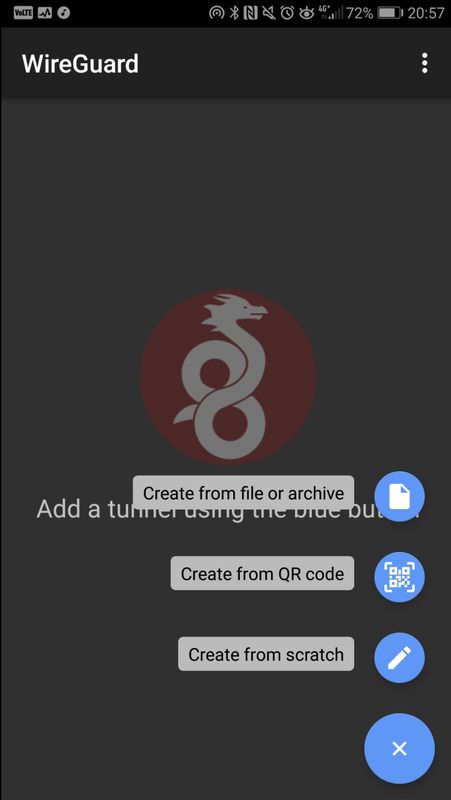 On an Android phone you don’t have to install anything more than the WireGuard app from the play store. The resolvconf package I meant would be on a Linux client. So this means the client can reach the DNS server correctly but does not get an answer. Therefore, it looks more like a DNS server misconfiguration. Is the nameserver listening on all interfaces or maybe only on the physical ethernet (eth0 or something like that) device? Either 0.0.0.0 (all interfaces together) or the 10.23.5.1 interface itself should be listed there. If this is not the case, look in the documentation of your nameserver how to configure it that the server listens on all interfaces. You can try to debug by performing some dig commands by explicitly specifying the listening address. If this does work, it is most probbably a firewall issue. Wow, you were absolutely right, the DNS server was only listening on the physical NIC (kind of feel like an idiot now). I’m running the Wireguard server on a Raspberry Pi with pi-hole (which acts as a DNS server). For people who run into the same problem with the same setup, the following command did the trick for me: “pihole -a -i all”. This tells the pi-hole DNS server to listen on all interfaces. Again, thanks for your time man. I really appreciate it! You don’t have to feel like an idiot, that’s a typical error if you don’t do such specific things very often. And when you learned it the hard way (like now), you’ll (hopefully) never forget it. So it’s even better you made this mistake so you learned something! I barely got Wireguard working tonight with 1 IP and just found this, amazing! A proper scenario covering most use-cases and such sweet detail that it makes the Arch linux Wireguard wiki look out of touch, impressive indeed! I have a Q – what changes (if any) are needed if the WG Road Warrior notebook in your scenario above, was replaced with a linux router serving 2 LANs, (192.168.1.0/24 & 192.168.10.1/24) and we wished to route both LANs through the WG VPN Server? Thanks for the feedback. I’m happy this tutorial helped you! It depends if the Linux router preforms NAT or not. If the router performs NAT, then it’s not neccessary to change the configuration, because your two networks are “hidden” behind the NAT. Note: I have not tested this configuration, but it should work. But it would be interesting to try it out. That was it, cheers mate! Can’t recommend this tutorial enough to understand the innards of WireGuard. 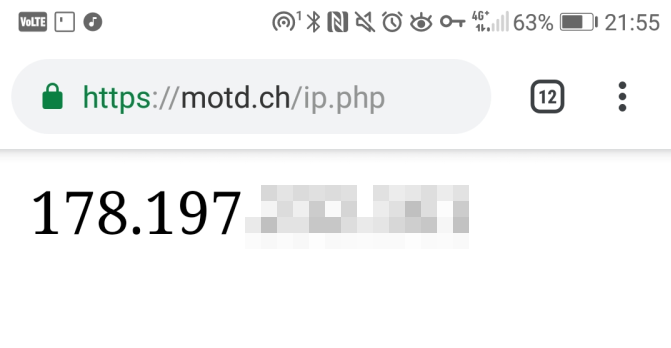 A few notes on MTU..
My ISP suggests an MTU of 1448, so my correct MTU on the WG interface on OpenWRT would be (1448 – 18) bytes for the VPN overhead. I host the VPN server with Google, and apparently, GCE has an MTU of 1460 bytes. This caused a weird issue where everything but Google related pages Gmail/Search/Cloud Console would time out till the MTU was corrected. My thanks to the helpful folks on #wireguard@Freenode for helping me nail this. then you could get away with N=1440 bytes. I setup wireguard but it’s being blocked at McDonald’s – assuming they have blocked ports and that’s why. It works at work and tims for example on their public wifi. I have tried setting up wireguard on a few different ports, nothing works. Thoughts on evading port blocking on wifi hot spots? Your client must be able to connect to the port where WireGuard accepts connections. It looks like McDonald’s is blocking your port. As a first try, I would try port 53 (which is used for DNS) and 500 (which is used for the key exchange in IPSec VPNs, IKE). If the port is not open, you cannot directly connect to the outside. Another technique to build up a tunnel to an external server would be to use a DNS tunnel. That works in most environments but is very very slow. It does always work if your client can lookup arbitrary DNS records from the network using the provided DNS server.